Teach them about native African tribes and Africa culture with fun crafts! These free African crafts for children are fun and easy to do with things you can find around the house! Native African tribes are famous for their beautiful hand-woven baskets. You don't have to hand-weave these bowls but they will still be beautiful! See the one we made - we love it! 1. Cut your colorful fabric scraps into pieces that are between 2 - 3 inches wide. They can be square, circle or just silly shapes. 2. Choose a kitchen bowl, cereal bowls work well. 3. Turn your bowl upside down and cover it completely with plastic wrap making sure the plastic wrap hangs over the edges of the bowl. 4. Get out a plastic bowl and pour in some glue and then mix in the same amount of water so you have a half glue, half water mixture. 5. Dip your fabric shapes into the glue/water mixture, squeezing off the extra glue so your fabric isn't too wet. 6. 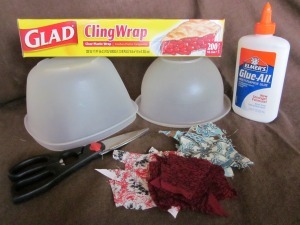 Glue your shape to the plastic wrap that is covering your upside down bowl. 7. 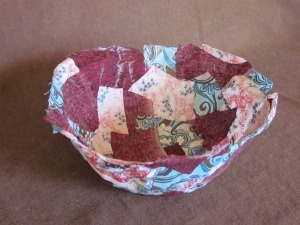 Keep repeating steps 5 and 6 until your bowl is covered with beautiful fabric. 8. 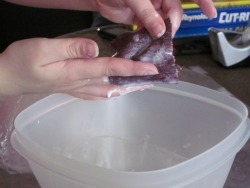 Let your fabric bowl dry until it is hard and no longer wet then remove the bowl from the plastic wrap. Voila! You made a beautiful, colorful bowl just like the native African tribes! Just remember that you can't put anything wet in your bowl or it will melt! 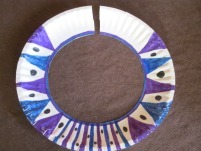 You can make a simple African crafts for children necklace that looks similar to this real one at home with only 3 things! When you're finished, you'll have a colorful necklace to wear while you do some drumming and dancing around the house to an African beat! 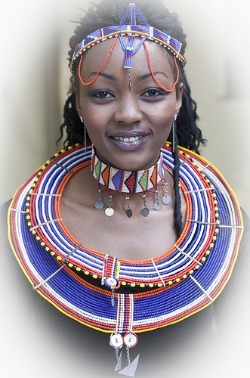 The image of the beautiful African necklace is by infomatique. That's it! 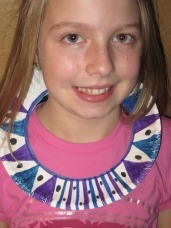 You have a one-of-a-kind African tribal necklace! Now I think you should dance around the house with it on to an African beat! Wait! You can't dance to the beat without an African crafts for children Drum! You can make one similar to these drums, only smaller - but don't worry, it will still keep an African beat! - an empty oatmeal container - don't throw away the lid! (Quaker Old Fashioned Rolled Oats round, cylinder container) That means you have to eat all your oatmeal before you can make a drum! 1. Color and decorate your construction paper however you want. You can glue your decorations on it too. 2. Then glue your decorated construction paper to the outside of the empty oatmeal container. That's it! Now you have your basket, your necklace and your drum - you're a true Native African now! 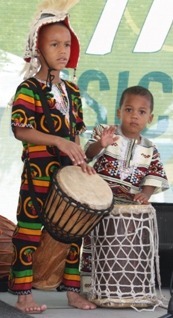 The image of the children playing the African drums is by TheWomensMuseum. Here's some books we recommend that are full of African Crafts for Children. Learn to draw animals from around the world with this animal stencil book for ages 4 and up.